This past summer I ran a Stoic School in Rome for three days (will do it again next year, so stay tuned…), during which I went through both the theory and practice of Stoicism. The goal was for the students to get out by Sunday night and have all the basic tools they needed to begin their journey as prokoptontes (those who make progress, as the Stoics referred to themselves). One of the useful tools that came out of that experience was a list of pithy phrases to keep in mind as reminders for daily practice, whenever the occasion arises. 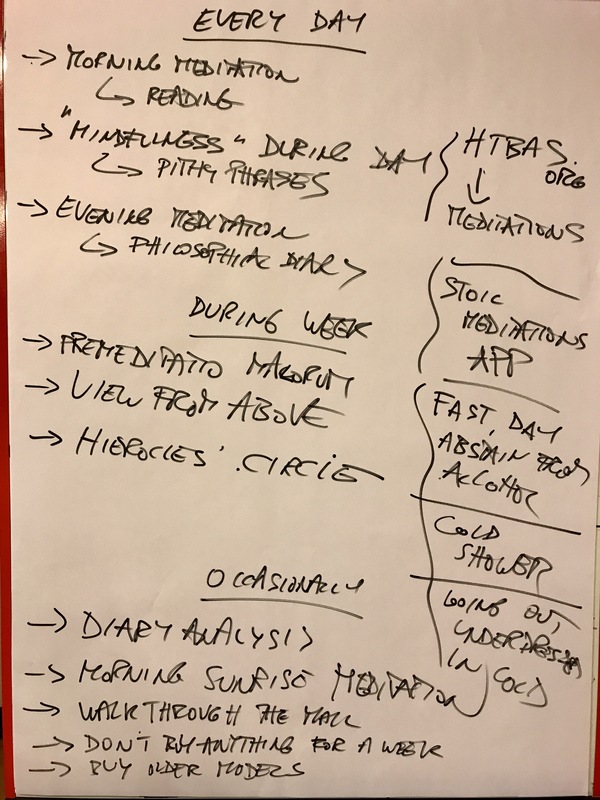 In this post I will present another tool we developed at the School, a list of daily, weekly or occasional practices that make very clear and easy to see what it means to “be” a Stoic, rather than just talk like one. The photo below was taken at the School, by the time we had reached the end of this particular discussion, and is a pretty handy (if a bit messy, and written in my quasi-illegible handwriting) summary of this post. Let’s go through it bit by bit. First, however, an important caveat. This is by no means the only way to practice Stoicism. It’s just my way. And I have tweaked my approach over time on the basis of what seems to work best for me, the time I have available, and so on. Therefore, the one below is just a possible template among many. To begin with, then, there are those practices that I do, or try to do, every day. I start with a morning meditation, which comprises two components. I pick a passage from one of the ancient Stoics (the same passage I share every day on the Stoicism Facebook page; here are several downloadable collections of such favorite quotes), read it two or three times, and reflect on how it may apply to my life. It’s a constant source of inspiration and meditation. I then briefly go over the upcoming day, focusing on potentially difficult situations that may arise and preparing my mind to react to them in the best possible way. The whole thing may take 5-10 minutes. When you relax your attention for a little, do not imagine that you will recover it wherever you wish, but bear this well in mind, that your error of to-day must of necessity put you in a worse position for other occasions. For in the first place — and this is the most serious thing — a habit of inattention is formed, and next a habit of deferring attention: and you get into the way of putting off from one time to another the tranquil and becoming life, the state and behavior which nature prescribes. Now if such postponement of attention is profitable, it would be still more profitable to abandon it altogether: but if it is not profitable, why do you not keep up your attention continuously? Is any part of life excluded, on which attention has no bearing, any that you will make worse by attention, and better by inattention? 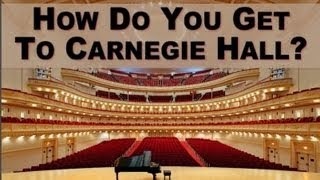 Nay, is there anything in life generally which is done better by those who do not attend? Does the carpenter by inattention do his work better? Does the helmsman by inattention steer more safely? And is any of the minor duties of life fulfilled better by inattention? That’s what I try to do every day, all day. It sounds taxing, and it is in the beginning, just like it’s hard the first few times you go to the gym. But, just like going to the gym, your capacity to pay attention becomes better and better, and you make progress as a student of Stoicism. Every day, every moment. The evening examination does not have to be done in writing, of course, but I find that writing it down takes only a few minutes, helps me focus on the important bits, and moreover creates a record (searchable, in my case, since I do it on my iPad) of both your progress and the times when you inevitably slip back a little. That’s it in terms of daily practice. There are then some exercises that I try to do at least once a week, beginning with some listed on the right side in the photo above: gentle exercises in self-denial. These range from fasting for a day to taking a cold shower, to going out under-dressed in the winter. The idea here is not to punish yourself, or to experience pain (as mild as it is) for its own sake. Rather, there are two goals to this practice for the prokopton: (i) to remind yourself that things one might fear, like a dearth of food, or unpleasant living conditions, are nothing to be afraid of, because you can endure them; (ii) to appreciate just how good your normal life is, precisely because you can usually count on nice meals, hot showers, and warm clothing. At least once a week I also engage in one of a number of meditations exercises, such as the view from above, Hierocles’ circles, or the premeditatio malorum. You can find templates and links for those here. The last one is particularly useful if you are likely, in the immediate future, to face an especially difficult situation, like a job interview, or even the death of a loved one who is terminally ill. It needs to be done with caution, though, because it may be traumatic. The other two are ways to remind ourselves, respectively, of the vastness of the cosmos and of the interconnectedness of the human polis, both fundamental aspects of Stoic philosophy. In a sense, it plays a function similar to the view from above meditation, but it comes with the added bonus of actually going outside and experience the world as it slowly wakes up in the morning. I try to do that especially when I travel. Also, from time to time I engage in a retrospective analysis of my philosophical diary (see above), where I look for recurring patterns, or simply remind myself of what I was experiencing and thinking a year or two ago. The last three exercises listed at the bottom of the photo, again carried out occasionally, are variations on the same idea: (i) get to a shopping mall or district, and then deliberately and slowly walk through most shops, look at the things on display, and get to the other side without having bought anything; or (ii) set aside an entire week, from Monday to Sunday, during which you will not buy anything other than the basic necessities (e.g., food); or (iii) wait until the new model of a computer, mobile phone, or tablet comes out, then buy the older model instead. The point here is to remind ourselves of how externals are not important, that we can do without much of the stuff the clogs our lives in this hyper-consumeristic society. Incidentally, you save a bundle of money too! (I guess this means that Stoicism isn’t really good for capitalism. Oh well). Again, while the above may seem a bit overwhelming, or strike you as taking a lot of your time, it really doesn’t. Many individual exercises last for only minutes, and just a few need to be done frequently. At any rate, remember, this is just my approach, you can adapt it and change it as you like, so long as it works in the sense that you feel you are making progress. Finally, part of the right-hand side of the photo is a partial list of resources you can use to help you in your practice: the meditation links on this site (which include a set of audio meditations prepared by Don Robertson), and a couple of Stoic apps (here and here, currently only for iOS, but I’m advising an Android developer as well for the first one). Happy practice, everybody! This entry was posted in Modern Stoicism on August 16, 2017 by Massimo. How Stoicism becomes a Way of Life…..Great post, Massimo.